It is an analog meter can measure 0-300mA, it can work in -20 ~ 50 ℃, damping response time of less .. It is an analog meter can measure 0-1A, it can work in -20 ~ 50 ℃, damping response time of less tha.. It is an analog meter can measure 0-500mA, it can work in -20 ~ 50 ℃, damping response time of less .. It is an analog meter can measure 0-5A, it can work in -20 ~ 50 ℃, damping response time of less tha.. It is an analog meter can measure 0-3A, it can work in -20 ~ 50 ℃, damping response time of less tha.. It is an analog meter can measure 0-2A, it can work in -20 ~ 50 ℃, damping response time of less tha.. It is a DC Analog Ammeter,Measuring Range:DC 0-50mA,The basic error: + - 2.5%,Damping response time:.. It is an analog meter can measure 0-100mA, it can work in -20 ~ 50 ℃, damping response time of less .. It is a Digital Ammeter/Panel Meter, Measure Current Range: ±2A, Operating voltage: DC +5V ±0.5, It .. This is a very practical shunt, mainly composed of copper and copper-manganese welding joints, can e.. It is a Blue LED Ampere Meter+ Current Shunt,Measurement Range:DC 0-20A,Power Supply:DC 7-30V,small.. It is a Blue LED 10A Digital Ammeter,DC 7-30V Powered,can measure current range 0A-10A, build-with c.. It is a Blue LED Ampere Meter With Current Shunt Resistor,Measurement Range:DC 0-300A,Power Supply:D.. 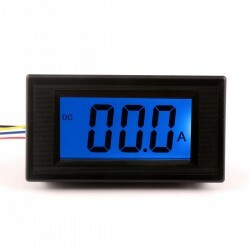 It is a Ultra-high Measurement Precision Three Wire Red/Blue/Green LED Digital Voltmeter, Power Supp.. It is an analog meter can measure 0-50mA, it can work in -20 ~ 50 ℃, damping response time of less t..